On Thursday, August 29th Circle Line 42 hosted Handles & Hashtags, a social media mixer for "socialites" working in social media. The mixer brought together some of New York City's best social media blabbermouths to mix and mingle in the old (in person) and new (on social media) way. During the two hour cruise on one of Circle Line 42's sightseeing boats, social media elite danced on the top deck while enjoying wine and beer. It was the perfect way to end the summer in the city and it was also a great way to meet other people who have a passion all things social media. Above: A fab view of the Freedom Tower from Circle Line 42's sightseeing boat. It is so cool to have lived in NYC while this iconic building was being built. Below: A fab view of Lady Liberty working her freedom and letting it ring from sea to shining sea! It was such an amazing night for an event like this! We got to enjoy the amazing views of the NYC skyline as well as pass by the Statue of Liberty which never seems to get old. Along with enjoying the weather and beverages on the Circle Line 42, we also were challenged to compete against each other to see who could create the best hashtag for the event. Some of my fave hashtags that I put into the ring to compete were #BloggersOnBoats, #SailingWithStyle, #BoatingBloggers and #WerkYourFreedom (we were cruising past the Statue of Liberty and I was saying "yaaas girl, werk your freedom"). Sadly, OJ&B did not win any of the fab prizes but congrats to those who did! Since it is the end of summer, and I am not sure when I will be imbibing on a boat again, I wanted to look fun and fab! I chose a blue shirt with white stripes paired with a gold anchor necklace, my gold reto inspired Timex watch and my brown leather envelope man clutch. I felt comfortable yet chic in this outfit. I love a good low hanging necklace with a fun pendant and I really need slash want to get more man clutches. Who says you can't have fun accessories if you are a guy? I encourage all men to have fun with fashion and accessories and I encourage women to encourage their guys to do so as well! Thank you so much to Circle Line 42 for having OJ&B at the 'Handles & Hashtags' social media mixer! It was a fab night and a great end to my 2013 summer in New York City! 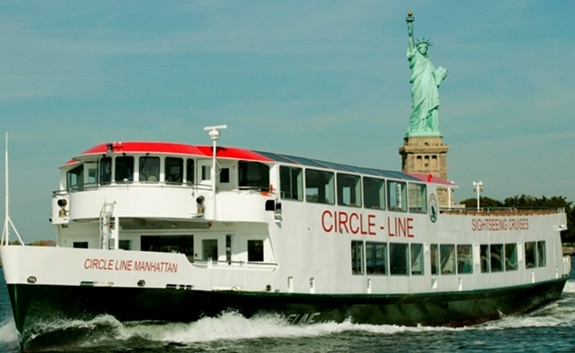 If you want to see Manhattan from a Circle Line 42 sightseeing boat or would like more information, you can click here.